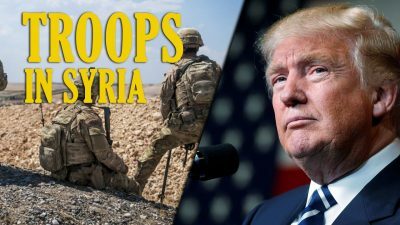 A contingent of US troops will remain deployed in Syria even after the troops withdrawal declared by President Donald Trump. On February 21, White House press secretary Sarah Sanders announced that “a small peacekeeping group of about 200” troops will remain in Syria for “some period of time.” By February 22, it had appeared, according to US officials quoted by mainstream media, that Sanders had underestimated the number of troops remaining. According to these reports, 200 US troops will remain in northeastern Syria and 200 others will remain in the al-Tanf base on the Syrian-Iraqi border. By February 23, the story had developed further with the Pentagon officially declaring that the remaining US troops will be a part of the multinational force consisting of “primarily” NATO member states. While Pentagon spokesman Commander Sean Robertson, provided no manpower estimations for this force, media reports relying on US defense officials suggested that the US allies will keep from 800 to 1,500 troops. Therefore, from 1,000 to 1,700 troops, 200-400 of whom will be US personnel, will remain deployed in the war-torn country alongside with an unknown number of private military contractors. Comparing to the current 2,000-3,000 US troops operating in Syria, this is a notable decrease. However, this is far from any kind of the rapid and full troops withdrawal announced by the US president in December 2018. To continue projecting power in Syria assisting to Israel in its operations against Iranian and Iranian-backed forces. Meanwhile, Washington also continued its diplomatic campaign against Iran. During the Warsaw conference held on February 13-14th, the US, Israel and Saudi Arabia once again attempted to establish a multi-national anti-Iran coalition to crack down on the growing regional power. This effort failed mostly because a neutral stance of EU states. However, this does not mean that the conflict between the Iran-Hezbollah bloc and the US-Israeli-Saudi alliance has any real chances to be de-escalated.